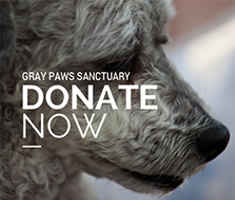 Local Youth – Vinny Garancsi – Supports Gray Paws Sanctuary! A HUGE “Paws Up” Vinny Garancsi for the doggie treats! Vinny used his allowance, good report card money, and did extra chores to buy the doggies something special. You’re a great little guy, Vin! There’s gonna be lots of crunchin’ and munchin’ tonight!! Gray Paws Featured in the Mon Valley Independent! Ground Breaking for NEW Sanctuary Home!! Gray Paws Co-Founders purchase land in White Oak, PA!! Pittsburgh Post Gazette Article – Shout-Out to Gray Paws! Copyright © 2019 Gray Paws Sanctuary. All Rights Reserved.